© Copyrights Tai Chi Productions 2007. All rights reserved, no part of this article may be reproduced in any forms or by any means, without permission in writing, except for non-profit educational purpose. For example: you can photocopy this article for a friend, paying student, or conference participant as long as this article is not included as part of your charge. Tai Chi is one of the best known martial arts of the Internal systems from ancient China. Based on Qigong and martial art techniques from thousands of years ago, Chen Wangting developed the Chen Style Tai Chi around 1670. It is characterised by contrasting and complimentary movements-slow and soft versus fast and hard. It contains explosive power and low stances. Chen style is more difficult and physically demanding than Sun style; thus it is not the best style to start with if you have arthritis. Yang Lu-chan learned Tai Chi from the Chen village. He later modified it with higher stances, gentle and slow movements, making it much more suitable for more people. From Yang and Chen style, three other major styles developed – Wu, Hao, and Sun. Each of these styles share similar essential principles, but contain different features and characteristics. Sun, the latest style, is most suitable for people with arthritis. Tai Chi, also known as Shadow Boxing, is one of the major branches of the traditional Chinese martial arts. Its name is derived from the philosophical term, “Tai Chi,” the first known written reference of which appeared in the Book of Changes over 3000 years ago during the Zhou Dynasty (1100-1221 BC). In this book it says that “in all changes exists Tai Chi, which causes the two opposites in everything.” Tai Chi means the ultimate of ultimate, often used to describe the vastness of the universe. The essential principles of Tai Chi are based on the ancient Chinese philosophy of Taoism, which stresses the natural balance in all things and the need for living in spiritual and physical accord with the patterns of nature. According to this philosophy, everything is composed of two opposite, but entirely complementary, elements of yin and yang, working in a relationship which is in perpetual balance. Tai Chi consists of exercises equally balanced between yin and yang, which is why it is so remarkably effective. Yin and yang are polar opposites and are found in all things in life. In nature, everything tends toward a natural state of harmony. Likewise, yin and yang are always in total balance. Concepts such as soft, pliant, yielding and feminine are associated with yin, while concepts such as hard, rigid and masculine are associated with yang. Both sides complement each other completely and together form a perfect whole. Things which are perfectly balanced and in harmony are at peace; being at peace leads naturally to longevity. A perfectly harmonised person will show this balance and completeness by his or her tranquillity and peacefulness of mind. It is almost impossible to separate Chinese martial art history from legend. Legends hold interesting and useful messages; thus, I will share some with you.The real origins of Tai Chi are obscure. The more romantic and mystical accounts date back as far as the 15th, 12th or even the 8th century. One legendary figure, Zhang Shanfeng, was a famous Taoist priest in the 15th century. He was believed to possess super-human ability and immense internal power. Less romantic, but more reliably sourced, accounts of Tai Chi, date back to Chen Wangting, a 16th century Royal Guard of the Chen village in Wenxian County, Henan Province. After retiring from the army, he was drawn to the teachings of Taoism, which led him to a simple life of farming, studying and teaching martial arts. In the 1670s, Chen Wangting developed several Tai Chi routines which included the old frame (classical Chen style) form still practised today. He was greatly influenced by schools of boxing, particularly that of a famous general of the Imperial army, Qi Jiguang. Qi Jiguang wrote an important textbook on military training called Boxing in 32 Forms. Perhaps more significantly, Chen Wangting assimilated the ancient philosophical techniques of Daoyin and Tuna into his martial art routines. These techniques, together with the use of clarity of consciousness, developed into the practice of Taoism.Daoyin is the concentrated exertion of inner force, while Tuna is a set of deep breathing exercises. Tuna has recently developed into the popular Qigong exercises. He also adapt the core phylosophical understanding of Traditional Chinese Medicine. By combining martial art exercises, the practice of Daoyin and Tuna and Traditional Chinese Medicine, Tai Chi became a complete system of exercise in which the practitioner’s mental concentration, breathing and actions are closely connected. It paved the way for its current use as an ideal form of exercise for all aspects of health care. Since then, Chen style had been kept almost in secrecy within his village. The clan taught Tai Chi to their daughters-in-law, but not their daughters, lest they took the art outside the village (there was no such thing as divorce in those days!). In his later years, Chen Xin, a member of the 16th generation of the Chen family, wrote and illustrated a detailed book about the Chen school of Tai Chi. In it, he described the correct postures and movements, and explained the philosophical and medical background of the routines. This was not, however, published until 1932, after Chen Fake, a great grandson of the celebrated Chen Changxing, had taught the Chen style Tai Chi outside Chen Village. Chen Fake, who was of the 17th generation of the Chen family, was one of the most highly accomplished and possibly the greatest leader of the Chen style Tai Chi. There have been many stories told about his amazing prowess in Tai Chi, and also about his near perfect disposition: He was universally well-liked, making no enemies during the 29 years he lived and taught in Beijing up until his death in 1957. Chen Fake was the youngest child in his family and his father was 60 years old when he was born. His two elder brothers died in an epidemic, and as a result, Chen Fake was very spoiled. He was also rather a weakling and, because he was spoiled, he was never forced to practise Tai Chi. Chen Fake was also lazy and, even though he knew Tai Chi would improve his health, he did not bother practising it. By the time Chen Fake was 14 years old, he was the laughing stock of his village. His father, on the other hand, was recognised within the village as a leader and the most highly skilled practitioner of Tai Chi. As Chen Fake grew older, he began to feel ashamed, realising that he was letting his father down. He decided to try to catch up to his cousin, who was very highly thought of for his skill, strength and expertise in Tai Chi. But no matter how much Chen Fake improved, his cousin improved by an equal amount. Chen Fake began to worry that he would never catch up with his cousin. Then one day, while Chen Fake and his cousin were walking in the fields, his cousin remembered they had left something behind and told Chen Fake, “… Run back and fetch it. I shall walk slowly so that you can catch up with me.” As Chen Fake was running back to catch up with his cousin, it suddenly occurred to him that if he practised harder than his cousin he would eventually catch up to him. From then on, Chen Fake used every available minute to practice. Soon, he improved so much in strength and technique that he was able to beat his cousin in a sparring match. His father had been away from home at that time for about 3 years so Chen Fake’s spectacular improvement could not have been attributed to any special coaching from him. Rather, it was the result of the incredible number of hours he had put into practising. Chen Fake taught thousands of students during his years in Beijing. Many started Tai Chi to improve their health or even to cure a specific illness. Famous students of Chen Fake included Tian Xiuchen, Hong Junsheng, Liu Ruizhan, Tang Hao, Gu Liuxin, Lei Mumin, Li Jinwu, Feng Zhiqiang and Li Zhongyiun. Chen Style is characterised by its emphasis on spiral force. Its movements are similar to other martial arts. Slow and soft movements intermix with fast and hard ones. It is also characterised by explosive power and low stances. Chen Style is rich with combat techniques that are practical and effective, making it more suitable for younger people. Yang Style is the most popular. Yang Lu-chan (1799-1872) created it in the early 19th century. As a youth, Yang loved martial arts and studied with many famous masters. One day, he sparred with and was soundly defeated by a descendent from the Chen village. He was fascinated by his opponent’s unusual manner: His soft, curve-like, but powerful movements were totally unlike the predominantly hard styles of martial art at the time. Yang was so eager to learn the art, he pretended to be a beggar in starvation and fainted in the front door of the Chen’s village elder. He was rescued and accepted as a servant in the Chen household. Yang woke up at night to learn the art through a crack in the wall while others practised. He soon became a highly skilled practitioner. Later, when Yang was discovered, he could have been legally executed for is behavior in those days, but the village elder was so impressed with Yang’s skill, he formally took him up as a student. Yang later left the village, traveling around China, to teach the art. He gained a great reputation and was named, “Yang the Invincible.” Yang eventually developed his own style, which he taught to a great number of people, including members of the Imperial Court. Yang style is characterised by gentle, graceful and slow movements, which are easier to learn and promote health. Yang style has become quite popular in modern times. There are some Chinese words which have entirely different meanings but share a similar sound; therefore their Pinyin spellings are the same. This “Wu” is different from the next Wu Style in Chinese. It is also known as Hao Style. It was created by Wu Yuxiang (1812-1880), and passed on to Hao Weizheng (1849-1920), who significantly contributed to the style. Hao is not a well-known style. Its creators had studied both the Yang and Chen Style. Hao is characterised by slow and internally loose movements, which are close-knit in outward appearance. Great emphasis is placed on internal force and correct positioning. External movements and the transference of the substantial and insubstantial are controlled by internal power. When looking at a high-level practitioner performing the Hao style, it appears larger and more rounded, as though it’s inner power has extended further than the outward physical shape. Wu Quan-you (1834-1902), and later his son Wu Jian-quan (1870-1942), created this other Wu Style; it is characterised by softness and emphasis on redirecting incoming force. It is rich with hand techniques. Wu style tends to have a slightly forward leaning posture. The advantage of the Wu Style is that it is pleasant to look at, and is rich in techniques. Sun style is the youngest of the major styles. It was created by Sun Lu-tang (1861-1932). Sun was a well-known exponent of the Xingyiquan and Baguaquan (two famous internal martial art styles) before he learned Tai Chi. In 1912, Sun happened to run into Hao Weizheng (see Hao style), who was sick. Without knowing who Hao was, Sun kindly took care of him by finding him a hotel and a doctor. After Hao recovered from his illness, he stayed in Sun’s house to teach him Tai Chi. Sun later created his own style which is characterised by agile steps. Whenever one foot moves forward or backwards the other foot follows. Its movements flow smoothly like a river, and there is a powerful Qigong exercise whenever the direction is changed. Sun Style has high stances. The unique Qigong in Sun style brings great internal power, like water in the river, beaneath the calm surface there is immense power within the current. This power is especially effective for healing and relaxation; its higher stances make it easier for older people to learn. It is also compact, not requiring a large space in which to practise. Sun has so much depth that it holds learners’ interest as they progress. All Tai Chi for Health Programs by my team contains movements in Sun style for its efficacy and safety. The flow of Qi is an enjoyable feeling that a practitioner acquires more quickly from learning this style. There are many more Tai Chi styles and forms in addition to the ones mentioned above. The numerous styles and forms of Tai Chi can be overwhelming to beginners and advanced practitioners alike. Readers should view the many forms as an opportunity to make choices, rather than as an array of confusion. Tai Chi can be simple and easy if you define your aims and objectives. 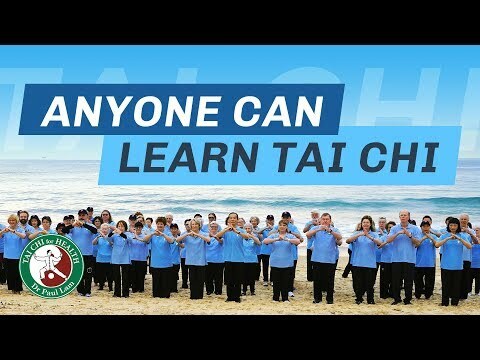 For example, if you wish to learn Tai Chi solely for its health benefits (instead of self-defense), learning the Tai Chi for Arthritis program with the 12 movement set is simple and effective. Over a million people by 2007 has enjoyed learning this set and gained health benefits. Since the 19th century, the Chinese have understood the immense health benefits of Tai Chi, and its popularity has grown steadily. Now, Tai Chi is practised in almost every corner of the world. It is one of the most popular exercises today with more than 300 million participants.As we are surviving longer than our ancestors, chronic diseases such as arthritis and diabetes affect more of us, diminishing the quality of our lives. Increasing scientific and epidemiological evidence indicates that exercise is essential for prevention and management of these chronic diseases. Many studies have shown Tai Chi can deliver many health benefits. The popularity of Tai Chi will take another quantum leap as more people experience its enjoyment and benefits. Xing Yi Quan Xue: The Study of Form-Mind Boxing by Sun Lu Tang. Translated by Albert Liu. Published by High View Publication, Pacific Grove, CA. What Can Tai Chi Do for You? 1. How Does Tai Chi for Memory Work?